Zlatan Ibrahimovic's transcendent skill to decide today's game against Roma almost succeeded in making me forget that Milan have to play, on somewhat equal terms, Barcelona on Wednesday. The goal was astonishingly skillful, and another finger in the eye of the peculiarly committed anti-Ibra brigade. 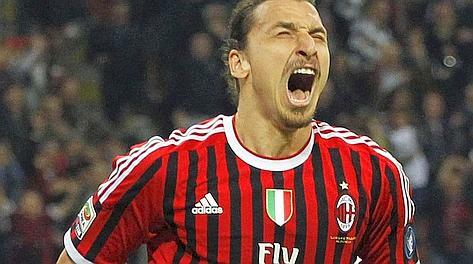 Milan were 1-0 down before Ibra scored a penalty and the winner. Milan are now seven points ahead of Juventus, who play Inter tomorrow. Yet, it was when the Milan-Roma game was young, only at nine minutes, still emerging and taking shape, that Milan fans witnessed an injury to Thiago Silva, an injury that can potentially have a devastating impact on their Champions League campaign. Coach Massimiliano Allegri has to take a generous portion of the blame here. Silva was risked in a Coppa Italia semi-final mid-week clash against Juventus. It was all in vain as well as Milan were eliminated, but, more crucially, Silva was injured. Today he went through a tentative warm-up before the game. Ten minutes in, his pre-game diffidence turned into total despair. He was taken off, and Allegri has confirmed he will not be available for Barcelona. "I took a risk with Silva, and we paid dearly for it." said Allegri. "He has a problem with his hip flexor, and he will certainly not play on Wednesday." Philippe Mexes has been unwilling to concede even an inch, and Daniele Bonera is probably playing some of his best football, so Milan can be optimistic. Further, Alessandro Nesta, who contained Lionel Messi so well during the Champions League group stage clash at the Camp Nou, also returns. However, Silva's injury, at such a crucial point of the season, redounds to the bafflement at the medical attention Milan players are receiving from the much vaunted Milan Lab. As Gazzetta reported, Milan have had the most injuries this season (Juventus the least), and were it not for a capable squad, they would have disintegrated a long time ago. Those discussions, however, will not be the prevalent ones on Wednesday. There is the small matter of Lionel Messi, and defying the smothering, near unanimous expectation of a Barcelona win.